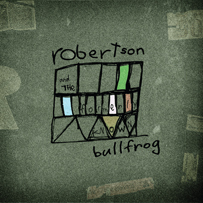 Robertson and the Formerly Known Bullfrog is the brainchild of singer/guitarist Mark Robertson, multi-instrumentalist, producer, and main instigator for Montreal's internationally acclaimed pop band - Bullfrog. Steeped in funk, heavily rooted in old school R&B; cool and smooth jazz and soul, romantic as Samba yet subversive as Reggae; Mark Robertson has toured internationally as Bullfrog (Rope-a-Dope/WEA), with Kid Koala (Ninja Tunes), and as bassist for Money Mark/Beastie Boys and with his own solo show. Since his first EP, Deeper Shade of Green, (Outside 2004), Mark Robertson has been turning heads as a solo artist; headlining clubs and festivals all over North America and Europe; Sharing the stage with big names like Marcus Miller, Manu Katche, Kesiah Jones, Vernon Reid, DJ Logic, and opening for artists like: Maceo Parker, The Wailers, Yael Naim, Charlie Winston, Micheal Franti & Spearhead, M.M.W., Soulive, Blue Rodeo, Bran Van 3000, Belleruche, Kid Koala, Money Mark, Martha Highs, Nneka and so many more. Mark has also been busy as a producer/writer: two EPs; Bullfrog I & II (Outside/Toys Factory); one LP (Ropeadope/Atlantic/Wea); co-writing on Kid Koala's Carpal Tunnel album, and Dj Vadim's Reconstruction (NinjaTunes). Robertson and the Formerly Known Bullfrog was self-produced in Mark's home studio. This sophomore album is a modern mix of vintage sounds and new technology; guitars laced with whas and mutrons, popping synths and jazzy keyboards, string and keyboard basses, live beats and sampled drums. And as always, his Bullfrog compatriot, Peter Santiago, is there to hold down the bass. From up and funky party tracks - featuring MC Blurum13 and Slim Williams, to downtempo, this album is a party starter. Mixed by producer Carl Bastien (Daniel Bélanger, Kid Koala, Dumas, Arianne Moffat, Bullfrog) at the legendary RCA Studio Victor in Montreal. Mark Robertson is a whirlwind of neo-soul and downtempo grooves and it's time for North America to re-discover what France and Europe have already been grooving to for the last few years.